1. 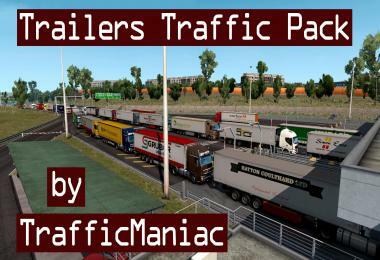 Added all trailer types, paintjobs and cargoes to traffic. 2. Adjusted spawn values of various AI vehicles for increased variety. 3. Adjusted maximum speed of various AI vehicles to more realistic values. 4. 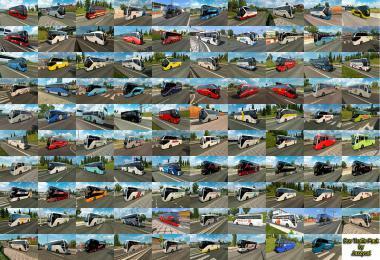 Adjusted engine torque of various AI trucks to more realistic values. 5. Adjusted weight for AI trailers based on the cargo files. 1. 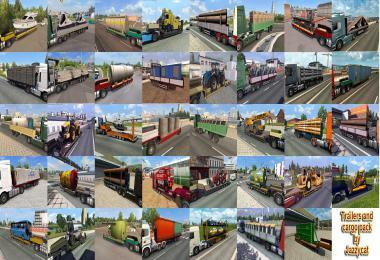 Various corrections/improvements to the trucks offered by the dealers. 2. Adjusted stock exhaust pipe price of Iveco Stralis Hi-Way to match the Iveco Stralis. 3. 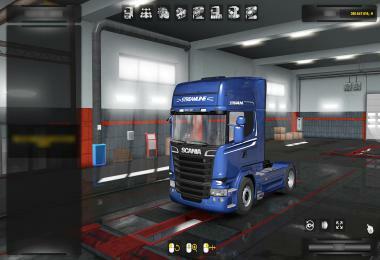 Adjusted bubbles paintjob price of Scania Streamline to match the other trucks. be available with the correct engine/cab combination). 1. 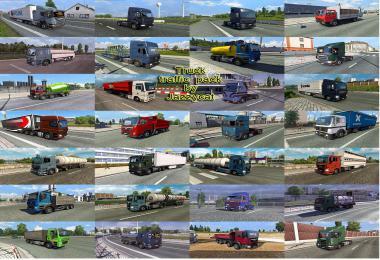 Various corrections/improvements to the first and quick job trucks. 2. Corrected cabin names of the Iveco Stralis and the Renault Magnum. 3. 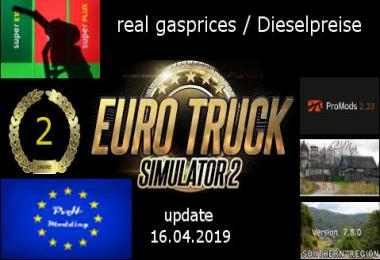 Accurate engine names for the Mercedes-Benz Actros (OM 501/OM 502 instead of V6/V8). 4. MAN LHD dashboard "30" and "50" KPH readings do not disappear at night. 5. Fixed the "400" badge texture of the MAN. 6. 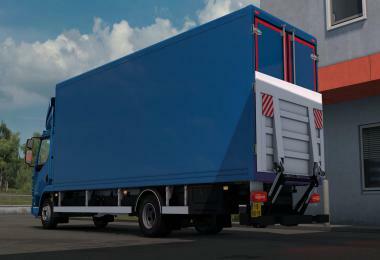 4x2 Iveco Stralis Hi-Way sideskirt can be removed. 7. Headlamps (halogen or xenon) are made dependent on the cab type, and not whether you have purchased a truck with halogen or xenon headlamps from the truck dealer. 8. Renault Magnum sunshield can be removed. 1. Adds real logos to various AI vehicles. 2. Changes Trailmaster, Elemental and Runner to Bridgestone, Continental and Goodyear. 3. 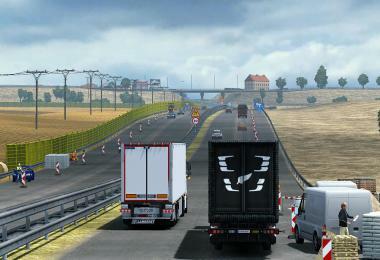 Changes Crown trailer liveries to Krone. 4. 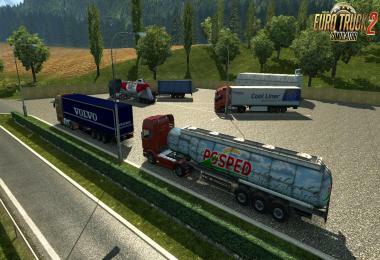 Changes Schmied BigCargo trailer logos to Schmitz Cargobull. 5. Changes Scout Cars to Škoda Auto. 7. Real logos for heavy duty equipment. 8. 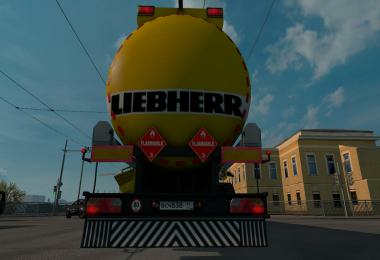 Real logos for heavy duty equipment added in the High Power Cargo Pack. 9. Changes Cooler Victor to Carrier Vector on the Schwarzmüller refrigerator trailer in the Schwarzmüller Trailer Pack. 1. Bricks and Concrete are added for transport. 1. lonestranger for the real logo heavy duty equipment textures. 2. Yusuf Bolukbasi for the Schmitz Trailer logos. 3. LT-Schall for the real gas stations mod. 4. Dragon.911 for the original real tires mod. 5. muerteh 650 for New Holland logo texture. 6. 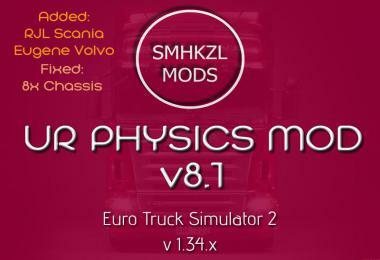 NJC2 for updating the mod to be compatible with V1.27.